With over 6 years of loyal service under it’s belt, the Bidule has become renowned the world over as a rugged and reliable workhorse of the sky. Not only known for its superb Aero-Towing capabilities but also for it’s precise and well balanced handing characteristics as a general sports model. Modified versions of the Bidule are even being used by our customers for both military and commercial applications. So if the Bidule has been so successful, why have we decided to “change” a proven design? Rather than go for “wholesale change” of an already strong and very successful product, we’ve gone for a more “evolutionary” approach. Taking on board the comments and suggestions from our private, commercial and military customers and incorporated this knowledge (gained over the past 6 years) to produce a fully coherent and truly evolved design. A new fiberglass engine cowling has been fitted which improves aerodynamics and gives a sleeker nose profile. A new front air shock / dampened landing gear is provided which improves ground handling on rough strips. A new fiberglass moulded main landing gear is provided which once again improves grounding handling on rough strips and exhibits very good “anti-bounce” properties on landing. A strong yet light carbon-fibre wing joiner is now provided. The Firewall is drilled to accept the superb DLE55 gas engine. We’ve updated both the color scheme, graphics along with associated decals. In addition many detailed improves have been made on the airframe. 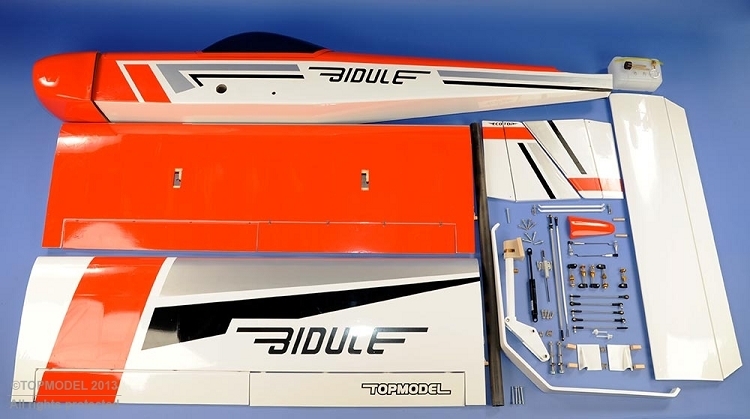 And of course the new Bidule 55 retains all of the fine qualities which made the original Bidule such a popular and best selling towing plane among Sunday flyers and professionals. The tricycle landing gear (which is particularly robust) was specially developed for this new aircraft. The nose wheel being fully dampened with an extra large track between the front and main Fiberglass gear, reducing “nose pitching” during both take-off and landing phases. The ground clearance with a two-bladed 22 "diameter prop is increased to about 3.5". The engine is mounted flat on a hyper strong aviation quality plywood firewall, with the mounting configured to allow the installation of tuned pipes to fit perfectly under the fuselage. For aesthetics, a fibreglass engine cowl (supplied painted) surrounds the engine without sacrificing cooling, essential for this kind of plane. A tinted PVC canopy mounted on its frame disassembles easily, thus allowing easy access inside the entire fuselage from the firewall to the towing hook (supplied in the kit). Excellent for easy maintenance! The two- parts wings (carbon wing joiner) are equipped with ailerons and powerful landing flaps to enable quick and accurate landing even from “tight” fields. The 2.5° of wing dihedral (per wing) assure that the Bidule keeps a straight and consistent tracking and is easily controllability in turns. 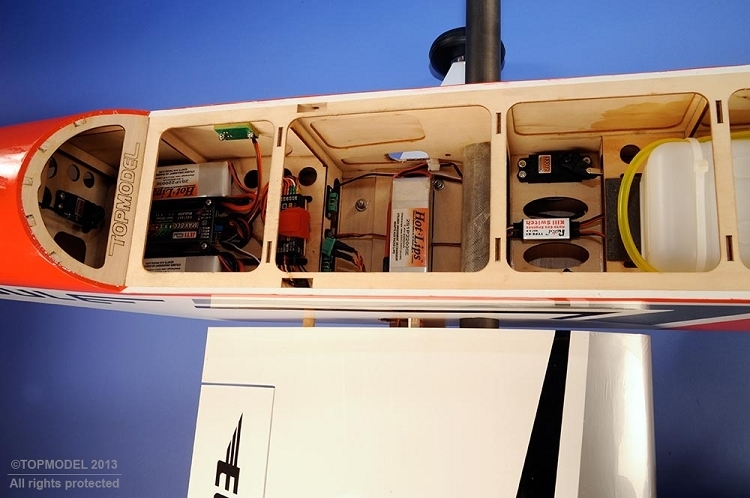 The tail is removable, the two rudder servos are integrated into the thickness of the airfoil and are accessible via two hatches. The two vertical stabilisers (fins) are also removable via 4 screws (with captive nuts fitted into the horizontal stabiliser). 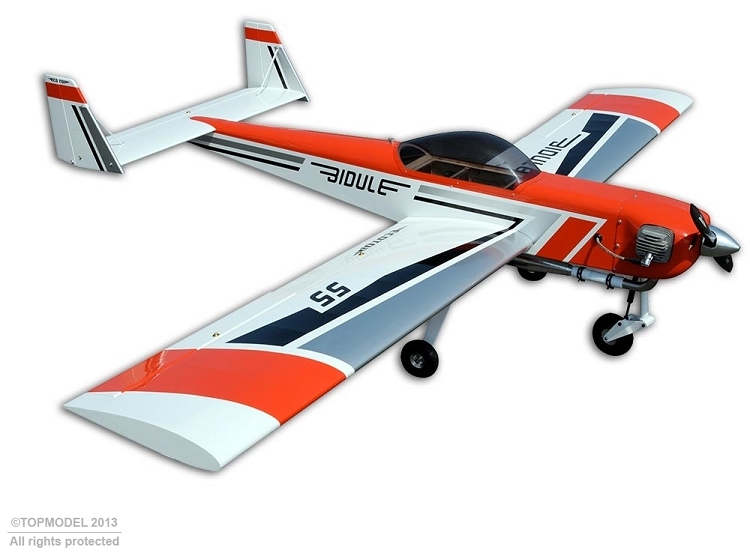 Thanks to the lightness of the airframe, the Bidule 55 can be powered with engines from 35cc, however for those who practice towing the powerful DLE55 is highly recommended. As mentioned previously, although the Bidule was originally designed as a professional towing machine, as a recreational aircraft, its ability to perform soft and sweet aerobatics really take some beating. In addition it’s light wing loading, large and powerful flaps, rugged landing gear and its twin rudder configuration allow this aircraft to be used from rough short-strips even in strong crosswinds. 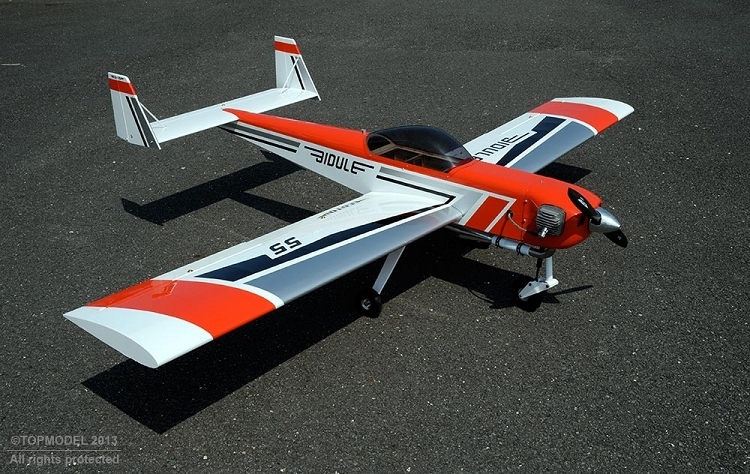 All built-up plywood and balsa fuselage, covered with Oracover®, with graphics and decals. Pocket for wing joiner installed - Geometry of the airframe already made at the factory. All the blind nuts for landing gear, wings, tail already in place. All-built-up wings (2 parts), covered in Oracover®, ready with graphics. Ailerons and flaps articulated with pin hinges (to be glued). Servo wells prepared. All-built-up horizontal and vertical stabiliser covered in Oracover®, with graphics pre-fitted. Elevator and rudder articulated with pin hinges (to be glued). Hardware (0.8l tank, towing hook, metal control horns, wheel axis, pushrods, clevises, screws, etc. ).